The Pitman girls swim team won the 5th Annual Girlz Rule Invitational after coming in third place last year. The Lady Panthers did it by winning the 200 medley relay and the Senior 200 freestyle relay, as well as placing in the top three in five other events. Pitman's Senior relay team of Samanatha Becker, Melissa Settar, Megan Gilmore, and Lauren Conova set a new meet record for the 200 freestyle. The all-girls meet, hosted by Highland and Triton, with the support of the Rowan University Swimming & Diving Teams, also was joined by Audubon-Collingswood, Camden Catholic, Delsea, Deptford, Eastern, Gateway, GCIT, Haddon Twp., Kingsway, Sterling, Timber Creek, and Williamstown. It was a game that many wanted to see who would win. When there are two teams who have played double digit games without a loss, it's definitely a must see. The Lady Chimeras from Willingboro traveled to Highland High School to decide which of these teams would remain undefeated. It was a classic game against two well coached and talented players showing why South Jersey basketball is very popular. In a non-league game, Willingboro's Crystal Langhorne sank two free throws with five seconds remaining in the game to defeat the Lady Tartans (14-1) by a score of 60-58. It was a game that on paper, the odds were stacked against your team. Most people tend to measure an event by looking at the records, using that to determine the outcome of a game. Paulsboro (11-3) were in third place in the Colonial Conference while West Deptford (9-5) was in fifth. For this game, West Deptford ignored that theory and defeated the Paulsboro Red Raiders at home by the score of 63-47. David Gooch scored two goals in thirteen seconds with less than one minute remaining in the game to rally Clearview to a 4-4 tie with Washington Township before a packed house at Hollydell on Friday night. Township could have all but sewn up first place with a win but no longer controls its own destiny. 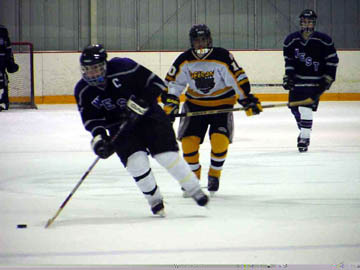 Cherry Hill West scored two short-handed goals late in the second period to snap a 3-3 tie as they defeated Delran 5-4 on Friday night at Hollydell. 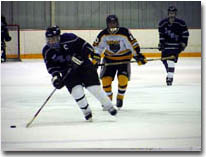 Mike Pelliccione led West with two goals and an assist. Chris Mirabella paced the Delran attack with two goals and an assist. After a first period that saw West dominate in shots 15-5, but trail in goals 3-2. West finally tied the score at 3-3 midway through the second period as Matt Magowan after jamming at the puck a few times, slid home his own rebound. Guillaume Lefebvre broke a 2-2 second period tie with his 14th goal of the season, leading the Phantoms to a 3-2 victory over the rival Hershey Bears at the First Union Spectrum. The Philadelphia Wings won their third straight game with an 8-7 victory over Buffalo Friday at the First Union Center in front of 11,785 fans. Goalie Dallas Eliuk made 43 saves for the win, while Tom Marchek, Jake Bergey and Jeff Ratcliffe led the offense with two goals apiece. The Berlin Township Eisenhower girl's basketball team won their first game ever at home. With the break-up of the Lower Camden County School District, the seventh and eighth grade students that went to Overbrook Junior are now back playing at their home. It has been a tough year for the team so far. They have played hard, but have not been able to win. This changed, as they defeated Brooklawn 29-23. Most basketball players have been in shooting slumps where nothing seems to work to end that scoring drought. Even the basic lay-up tends to roll off the rim leaving you in disbelief as a player and also a fan. Both Cherokee and Eastern were left with trying to figure out their shooter's touch through most of this game. Finally in the final quarter, Lance Evans hit three consecutive 3 pointers to finally break open the game by a 51 to 43 score. The Major Indoor Soccer League announced its 2002 All-Star teams Wednesday and five Philadelphia KiXX players-goaltender Peter Pappas, defender Pat Morris, midfielder Gary DePalma and forwards Joel Shanker and Chris Handsor-earned spots on the roster. The Phantoms and AAA Mid-Atlantic will be giving away a trip to Disneyworld this Friday, Jan. 25. The trip for two adults and two children includes round-trip airfare on US Airways; four-day, three-night accommodations at a Disneyworld resort; and a four-day hopper pass to the Disneyworld parks. Fans can register by mailing an entry to the Phantoms by Jan. 25 or stopping by the AAA table on the concourse through the second intermission that night. Fans who are not attending the game can just fill out an entry form in the box office lobby of the First Union Spectrum that night too. The lucky winner will be announced during the third period. Also on Friday, the first 7,500 fans will receive a pack of AHL trading cards, and don't miss a special ceremony for Phantoms All-Stars Mark Greig, Neil Little and John Slaney. Chris Andrews scored with less than two minutes remaining in the game to snap a 3-3 tie and lead Washington Township over Eastern 5-3. With the win, Township moved one point ahead of Clearview and Cherokee in the battle for first place. All three teams have two games left on their schedule. Nick Martorano paced the Township attack with three goals and Anthony Orner led Eastern with two goals.